After a brief hiatus for a chance to cool-off and draw a little inspiration from Europe, Alter. is back on it with their signature rooftop takeover/classic sundowners. 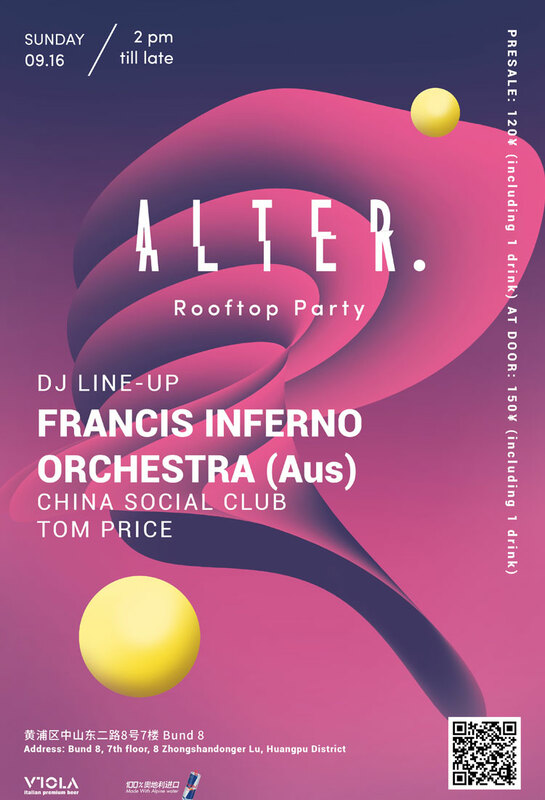 This time, the tunes are courtesy of versatile talent Francis Inferno Orchestra all the way from Melboune, along with local act China Social Club and Tom Price, lovingly moulding an afternoon's worth of indulgence of music across the genres. Francis Inferno Orchestra's wonky discofied off-kilter house sound has one foot in the past and one stretching hamstring-achingly into the future. Like a low-brow history lesson. The party starts at 2pm and goes late.